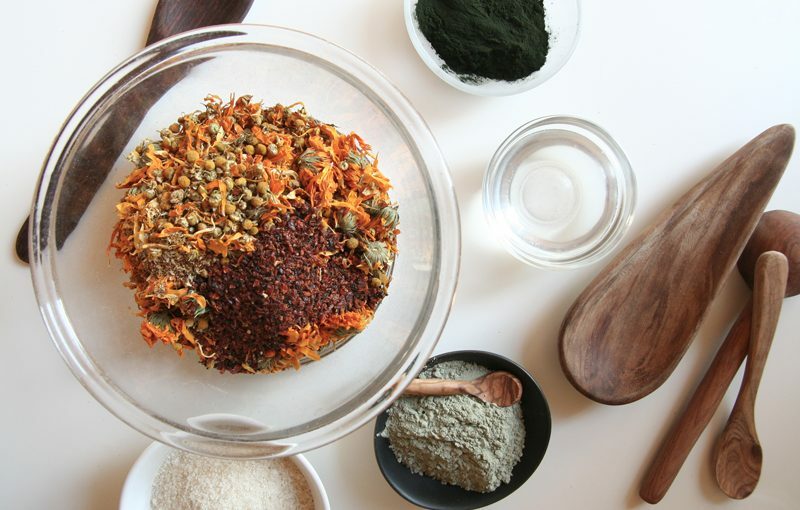 It might seem kind of bizarre to gather dried flowers, clay, oil and algae and blend it up and turn it into a facial scrub. Even me, a few years ago if you were to tell me that my bathroom cabinet would look more like a kitchen shelf, I would have laughed. If you think about it though, your skin is your largest organ and what touches it our bodies absorb and goes directly into our blood stream. To prove it to you, I have a challenge for you that my very good friend Ellie told me about… take a clove of garlic, rub a peeled piece on your foot and within minutes you will taste it in your mouth. The United States does not have an organization in place to regulate and oversee what cosmetic companies are doing. Just for example, the US has banned or restricted only 11 ingredients, while the EU has banned more than 1,300 ingredients. A lot of women like myself, can not pronounce all of the ingredients and chemicals in the products that they use and it is very important to know for yourself what you are putting into your body. When in doubt, I try to refer to the list from Beauty Counter called, “The Never List”. They have done their homework, and it is a list of ingredients that you never want to see in your beauty products. The hard thing about this too is that it does not come down to the money that you spend or where you buy it, whether it is a designer cosmetic from a department store or a cheap drug store mascara, you want to be careful. As women become more aware of what is in their beauty products, more and more natural beauty make up and products are being created. Which is amazing, but sometimes come with a high price tag. Not only is making your own beauty products a more cost effective way to switch out your beauty routine, it is empowering and fun! 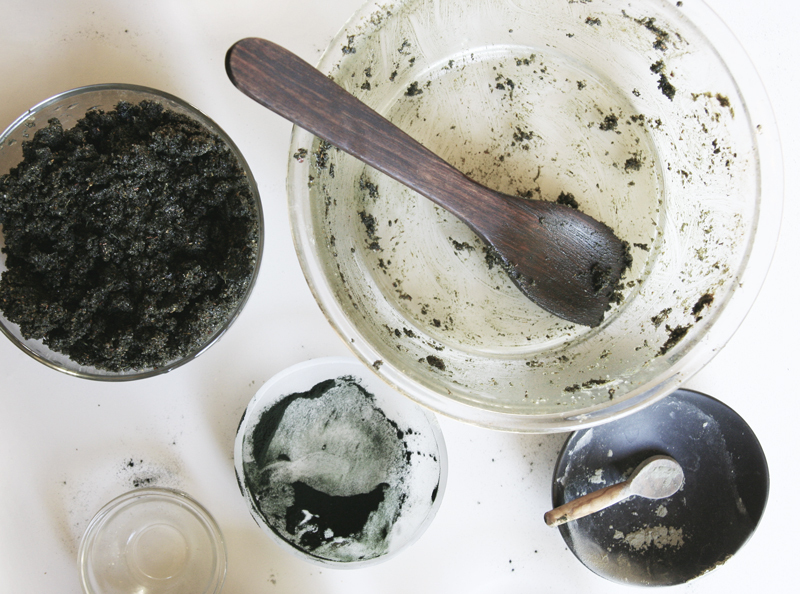 This Argan + Chlorella Facial Scrub will naturally exfoliate your skin while stimulating new cell growth. There are a lot of ingredients in this facial scrub so I thought I would take some time to discuss and highlight a few of its ingredients. Roobios: Roobios is a red tea that is harvested from the South African red bush plant. Roobios has an incredible taste, and is caffeine-free. I personally love drinking roobios tea with maple syrup and coconut milk. Roobios is rich in antioxidants, which are important part to our diet as they help protect our healthy cells from free radical damage. These antioxidants also fight wrinkles by neutralizing the free radicals, that cause them. This plant is also anti-inflammatory which helps with redness and irritation to the skin. Calendula: Calendula, is a flower known for it’s golden beauty. Calendula has been historically used to disinfect wounds and to treat infections of the skin. The antibacterial and immune system stimulant properties of the plant make it extremely useful in treating cuts. The plant also helps stimulate the production of collagen at wound sites and minimizes scarring. In history, people believed that because of it’s beautiful bright vivid gold color the plant possessed protective powers. Chamomile: Chamomile tea is a commonly used tea to help calm your mind and body before sleeping. Chamomile is a humble petite flower, that resembles a daisy and has a strong aroma. Chamomile tea has so many amazing healing properties, it is rich in antioxidants, antibacterial, anti-fungal, anti-inflammatory and antiseptic. It is also considered to be hypoallergenic with the ability to neutralize skin irritants. Rosehips: Rosehip is a remarkable natural product with amazing skin healing properties. Rosehips give a beautiful and natural glow to the skin when used regularly. This plant is rich in antioxidants which help protect your healthy cells of your skin. Rosehip is rich in vitamins, like vitamin C which reduces the appearance of dark spots, aging spots and hyper-pigmentation. French Green Clay Powder: This clay is a type of mineral clay which is valued and used in beauty products for its highly absorbent properties. French green clay powder is beneficial in removing impurities and tightening the pores, toning the skin, exfoliating and reducing inflammation in skin irritations. There is a lot to read about this amazing natural product, it is known to be one of nature’s most versatile remedies. Read more here. Argan Oil: Argan oil is an organic product extracted from the kernels of the argan tree which is native to Morocco. (Ah, I want to travel to Morocco.) It is extremely rich in beneficial nutrients, fatty acids and vitamin E. I have a bottle of argan oil by Acure that I just swear by and use everyday on my skin, hair and nails. 1. 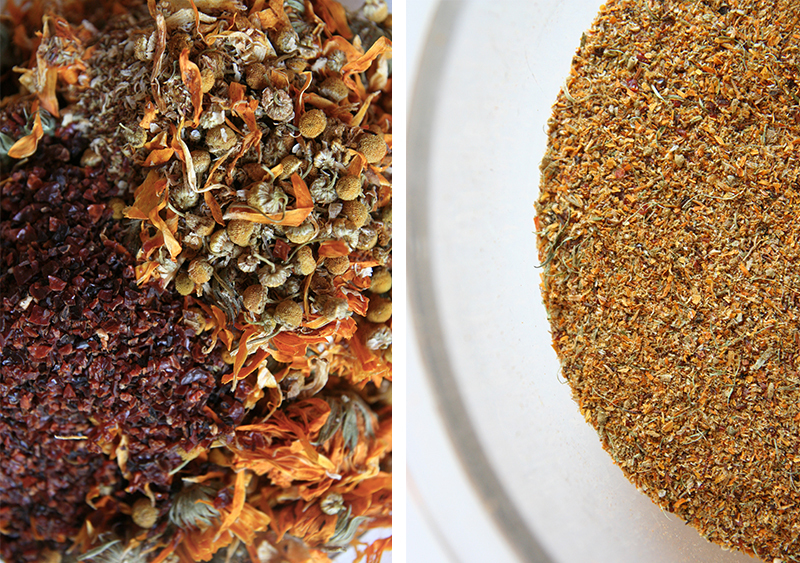 In a blender, coffee bean blender or spice blender blend roobios, calendula, chamomile, rosehips, dried lemon peel until they turn into a fine powder. Place your ‘flower powder’ into a large glass bowl. 2. 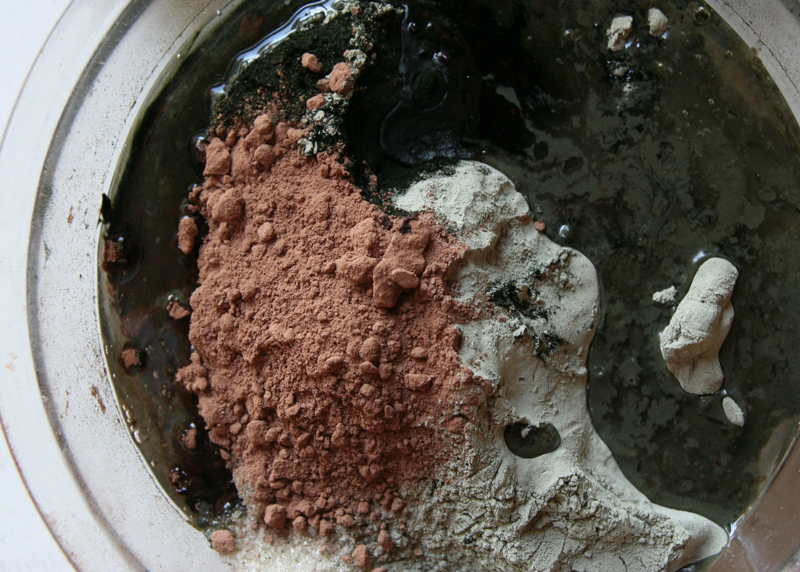 Slowly add sugar, green clay powder, chlorella powder, cocoa powder to the glass bowl. 4. Stir with a wooden spoon until combined. If too dry, add water.. if you add more coconut oil, it could become too oily. 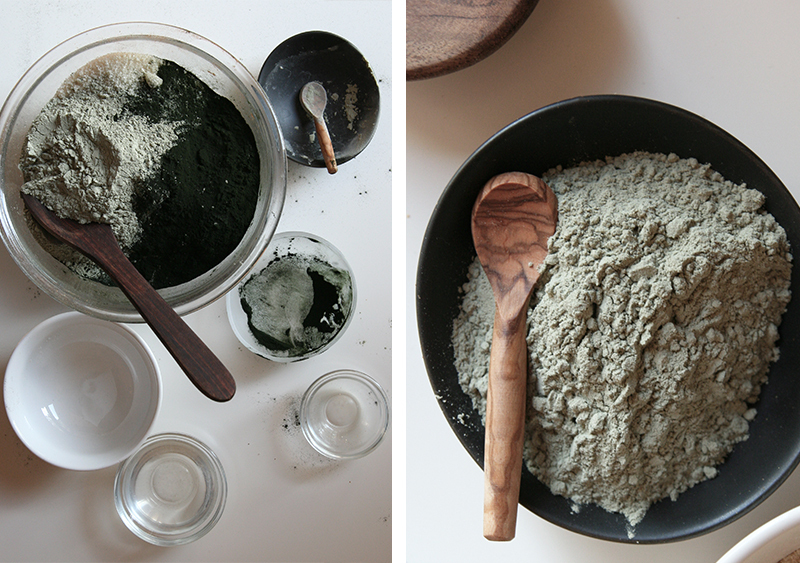 Note: Do not use metal tools when making this natural beauty product. Such an informative read and this scrub sounds amazing. 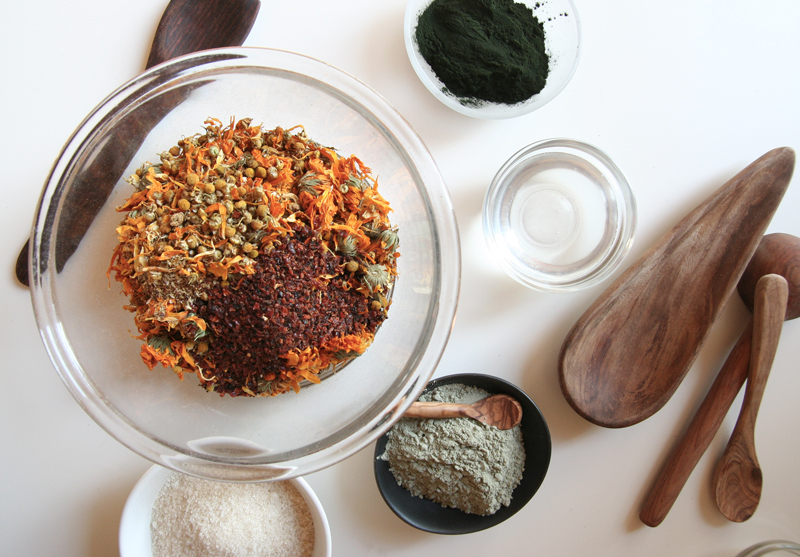 So many great ingredients for our skin! I want to make this soon. I also have the argon oil from acure 🙂 yay!